The Mediterranean tortoises and the Horsfield's or Russian Tortoise are the most popular pet tortoises in the UK. They have specific requirements that are different to other species of tortoises such as the Red Footed Tortoise or the African Spurred Tortoise. 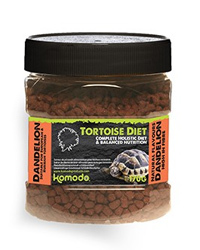 Komodo Tortoise Diet has been holistically formulated to provide a complete food for these popular European species. The diet is high in fibre and low in protein. It is formulated to have a calcium to phosphorus ratio of 3.5:1. Komodo Diet has been extensively trialed and tested to find the variety of tastes that these tortoises love.